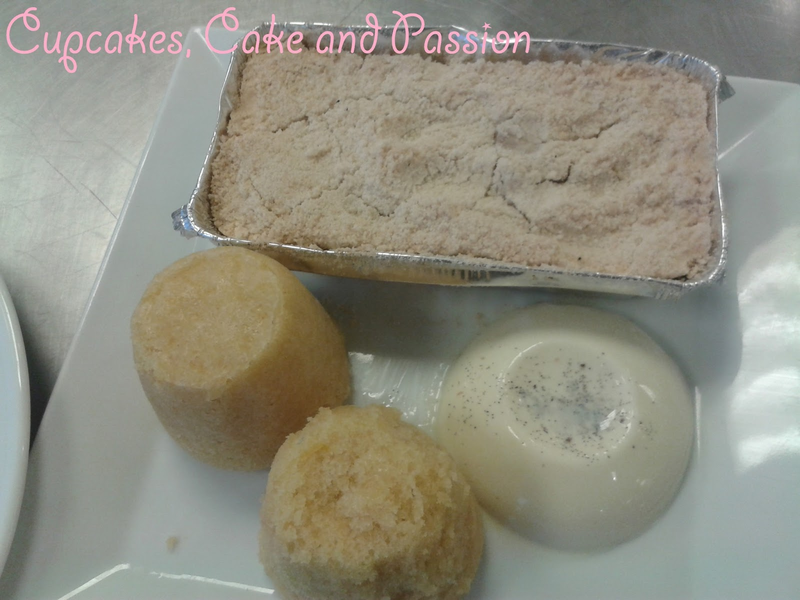 Cupcakes, Cake and Passion: Pastry Class: Fruit Bavarois, Vanilla Pannacotta, Lemon Steamed Sponge Pudding and Easy Apple Crumble. 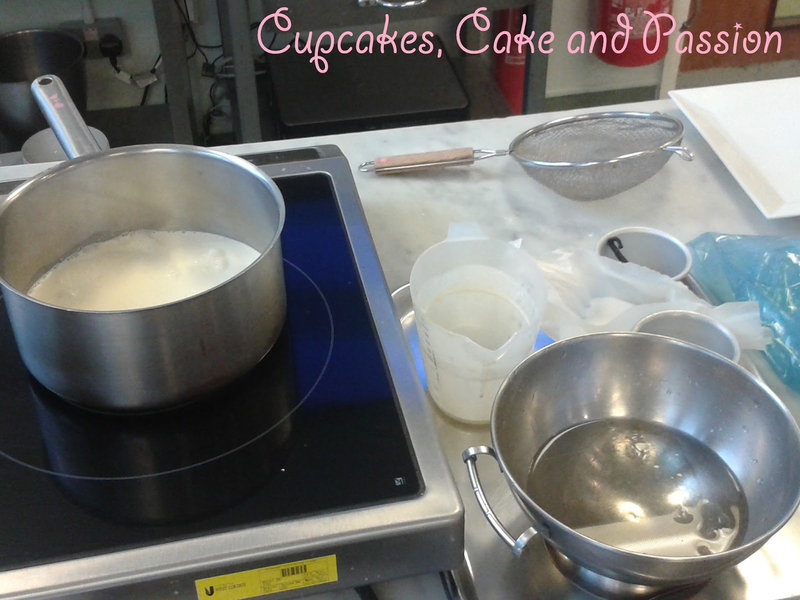 In this week's pastry class, we were continuing to look at hot and cold desserts. It was a mixed bag of recipes, all of which can easily be done with the intention of impressing your family and dinner guests. 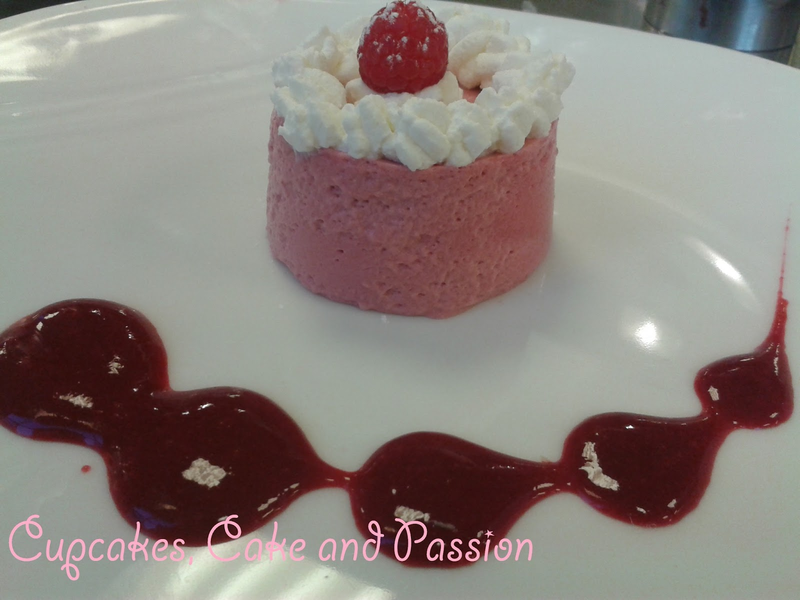 A bavarois is a type of mousse made with double or whipping cream. 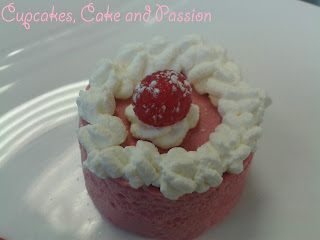 It can be made with chocolate, fruit or even vegetables. I wasn't surprised to see that Heston Blumental of the Fat Duck restaurant has already made a wacky version of a bavarois. 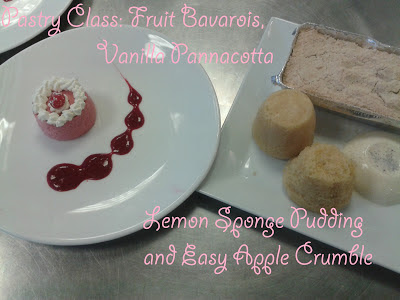 If your new to a bavarois, stick to fruit such as strawberries or raspberries. 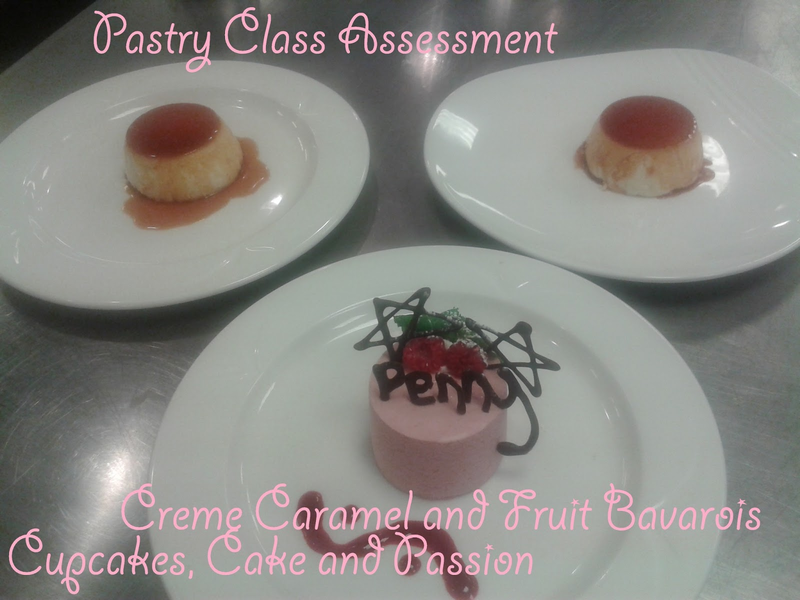 I had to do this for a pastry assessment along with creme caramel, which was surprisingly easy, why not give it a go? 1. 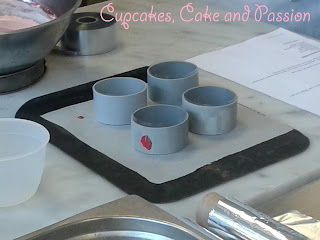 Line a tray with silicone paper and then line 4 small cook rings with clear plastic acetate. 2. Soak the gelatine in a small with cold water. Make sure that it is cold water as if the water is warm the gelatine will dissolve and become useless. 3. Whip the whipping cream until it just standing up, holding its peak. 4. Mix together the syrup and fruit puree in a saucepan and heat gently on a low heat. 5. Once the fruit and syrup has heated through, take off the heat and add the gelatine leaves. To do this, take the gelatine out of the water, (they should be squeezy and a little slimy) and squeezing until all of the water has been rung out. 6. Stir the mixture until the gelatine has dissolved, this should take about a minute. At this point you can add the lemon juice according to taste. If you’d like a really sweet mousse then omit the lemon juice. 7. To cool the mixture down as quickly as possible, have a bowl of ice ready. 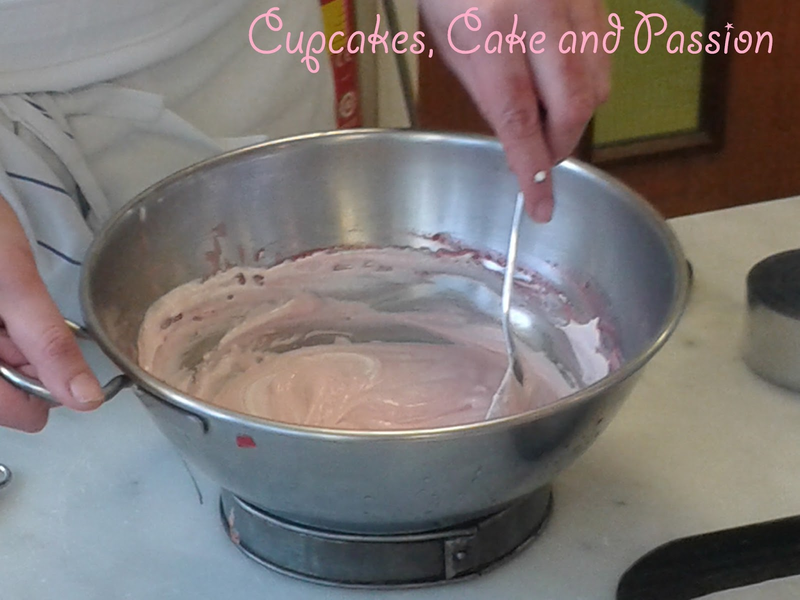 Put the fruit mixture into another bowl and place that into the bucket of ice and whisk lightly to cool down. Scrap the sides down once and a while so that the mix doesn’t set on the side of the bowl. 8. Once the mixture is cold enough then fold in the semi whipped cream in thirds. 9. Once all the cream has been incorporated, place the mixture into a piping bag and pipe into the cook rings. 10. Place in the fridge for about an 1 hour and 30 mins or until set. 11. To remove, place a palette knife under the bavarois and place on desired plate. Take the cook ring off and carefully peel the acetate off. 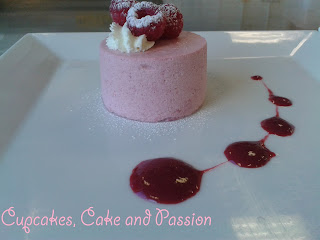 My finished bavarois made by erm me! 12. Keep the decoration simple, pipe a little whipped cream and garnish with raspberry and mint, and maybe a little icing sugar if your feeling fancy! Vanilla panna cotta to the right of this picture. Panna-cotta is an Italian cooked cream dessert that can be flavoured with chocolate, fruit or caramel. As long as you get the jiggly wiggly cream right its a sure-fire winner! 1. Soak the gelatine in a small with cold water. Make sure that it is cold water as if the water is warm the gelatine will dissolve and become useless. 2. 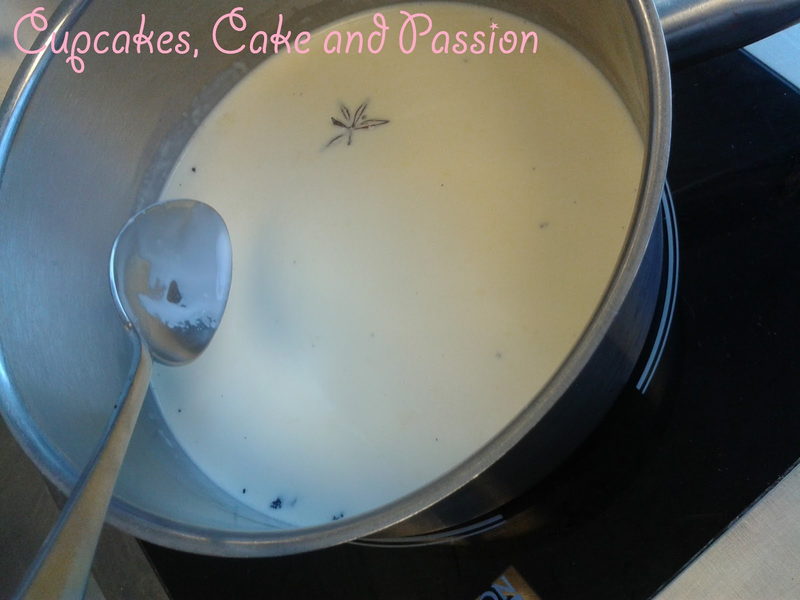 Add the cream, milk, the vanilla pod and the aniseed into a saucepan and heat gently until boiling slightly. 3. 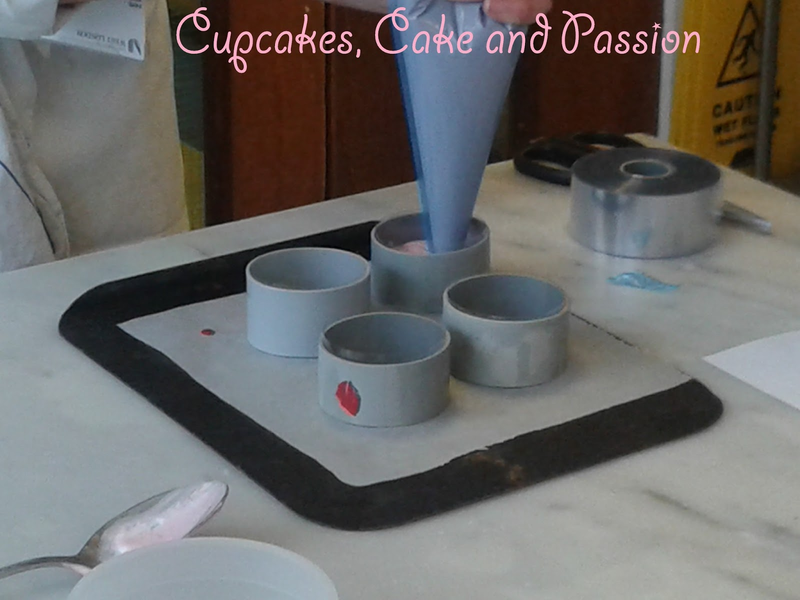 Once the mixture is hot enough add the sugar and gelatine. 4. Take the mixture off the heat and stir until the sugar and the gelatine has dissolved. 5. Sieve the mixture into a measuring jug. This removes the star anise. 6. Let the panna-cotta mixture cool for a few moments before pouring into the Dario molds and placing into the fridge for about 1 hour or until set. 7. The best way to get the pannacotta out of the mold onto a plate, is to have a bowl of warm water ready. Place the mold into the water for about 6 seconds, get your desired plate on top of the mold then flip the plate, so that is on a table. Wiggle the mold a little until it is evenly on the plate. There is little to explain about this. It's lemon flavoured sponge slowly steam cooked, perfect with custard or ice cream. 2. Sieve the flour and baking powder into a separate bowl and put aside. 3. Cream the sugar and margarine together using a spatula/hand held electric whisk. 4. Add the eggs one at a time, beating after each addition. 5. Fold in the flour and baking powder gently until fully incorporated. 6. Add the lemon zest and juice and fold in again. 7. 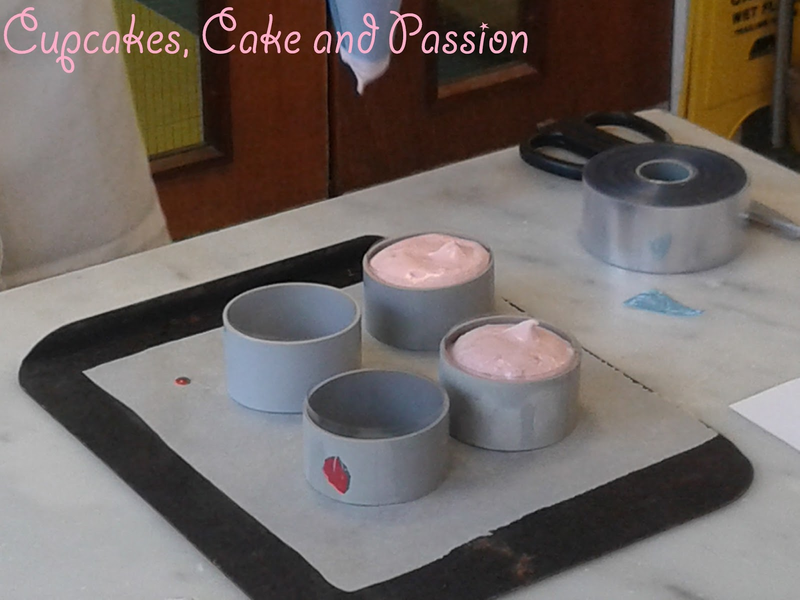 Spoon into the very well buttered and floured moulds. 8. Bake for 30-45minutes at Gas ¼/ 225f/ 110c. This is a steamed pudding, so the oven needs to be at a lower temperature. 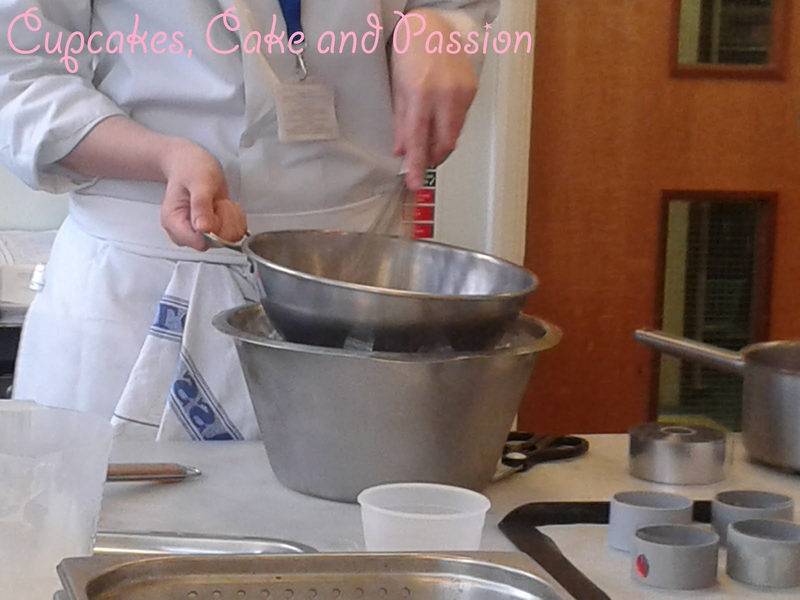 You will know when the puddings are ready when you can put a knife into the cake and it comes out clean. 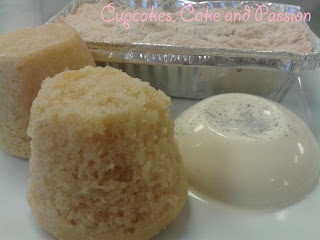 Apple crumble top of the picture. An apple crumble is, as far as I'm aware, is a British dessert which is served in Autumn when apples are at there best. This makes a great family dessert and is insanely easy to make! 2. Drain all the syrup from the apples using a colander Or peel, core and dice the apples. Put the fresh apples in a bowl of water with a little lemon juice to stop them from going brown. 3. Sieve the flour and sugar into a bowl with the butter, rub together until it resembles fine breadcrumbs. 4. Place the apples into the oven proof dish and then a pinch of cinnamon on top of the apples. 5. Sprinkle the crumble mix on top. Don’t be tempted to pack it down, this will solidify the crumble into a biscuit. 6. Bake the crumble for 40-45 minutes, or until the top is brown. I hope you've enjoyed this weeks pastry class!